All members received the following e-mail on Tuesday, June 26, 2018. RAHB members have asked us to find ways to improve professionalism across our association to ensure members are treating not only their fellow practitioners with the utmost respect, but also the public. Your RAHB Board of Directors has, in fact, made increasing member professionalism one of our top five strategic priorities for the next three years. 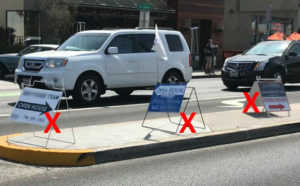 We and the City of Hamilton By-Law office have recently noticed an increase in signage infractions throughout Hamilton. 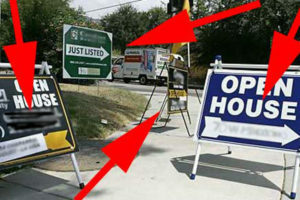 Specifically of concern is an increase in the number of open house directional signs within intersections and along roadways. This is outlined in Sign By-Law 10-197 (Real Estate Signs). 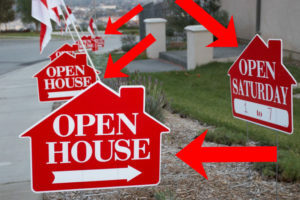 RAHB understands this by-law to mandate that there should be only one directional open house sign within an intersection, per property, within the noted time parameters. See below for examples of violations of the by-law. In an effort to curb these infractions and to increase professionalism, we have met with the City of Hamilton and will be working closely with them to ensure this by-law is enforced. We support the City of Hamilton in their efforts, including but not limited to the removal of signs that violate the by-law. We also support the City of Hamilton to conduct blitzes on weekends to enforce the by-law for RAHB members, as well as non-members. We also encourage our RAHB members to anonymously report real estate sign by-law violations throughout the City of Hamilton. To do so, please collect the information, take a photo of the infraction, and send it to Angela at angelam@rahb.ca. Additional information on the City of Hamilton’s sign by-law can be found on our blog at https://blog.rahb.ca/?p=9628. Angela in the RAHB office can also answer any of your questions via phone at 905.529.8101 x233. Thank you in advance for your compliance with these important by-laws, as well as your support in enforcement. Raising professionalism is good for all members.